Bafana Bafana midfielder, Dean Furman has been appointed as a Laureus Sport for Good Foundation ambassador, joining retired Banyana Banyana and Proteas Netball Captains Amanda Dlamini and Zanele Ndodana, Coach Desiree Ellis, Bafana Bafana legend Lucas Radebe and Springbok legends Jean De Villiers, Corne Krige and Bryan Habana in an esteemed group of South African sporting icons. 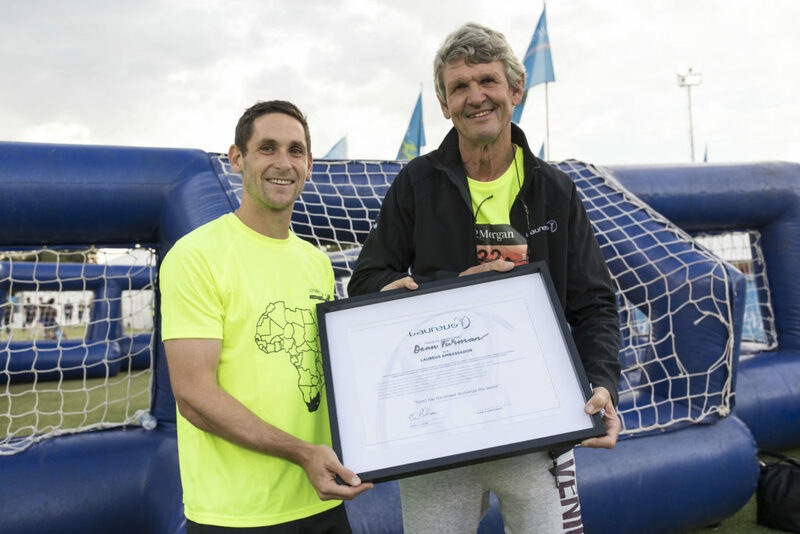 The announcement was made during the JP Morgan Corporate Challenge at the Wanderers Club in Illovo, where the Laureus Sport For Good Foundation are the beneficiary for the 6th consecutive year. Fellow Laureus Ambassadors Dan Nicholl, John Robbie, Natalie Du Toit, Morne Du Plessis and Deshun Deysel were all in attendance to congratulate Dean. Born in Cape Town, Dean and his family emigrated to the UK when he was only 5 years old. Within a few years he was scouted by leading Premiership club, Chelsea FC, where he spent almost 10 years in the clubs famed academy. Thereafter he joined Scottish Giants Glasgow Rangers, and had subsequent spells at Bradford, Doncaster and Oldham before “returning home” to captain Supersport united in the South African Premier Soccer League. He made his National team debut against Brazil on 08 September 2012 and earned his 50th cap over the past weekend in helping Bafana Bafana beat Libya in order to qualify for the 2019 African Cup of Nations tournament where he is expected to play a key role in the heart of the teams’ midfield. “As a professional sportsman who has been fortunate enough to represent my country I understand the key role that sports plays in society and through Laureus and the outstanding work that the organisation undertakes, my aim is to make a difference in the communities that support us,” said Furman.